It is only very recently that I have acquired a die/emboss machine. Mr Pixie gave me a Sizzix Big Shot for my birthday. While I am a HUGE fan of doing things the old fashioned way (you definitely DO NOT need fancy equipment for crafting) I do sort of feel like a big kid now that I have one of these cool kid toys. Some my very first dies? These super cute Movers & Shapers House and Window dies. Here I've used Graphic 45's An Eerie Tale to make a couple of very sweet Halloween houses but I'm looking forward to making loads of papery cottages. This duo will sit on my mantle with faux tea lights flickering inside, but I'm forecasting some gorgeous Christmas houses in my future! Oh these are so neat!!!!!! 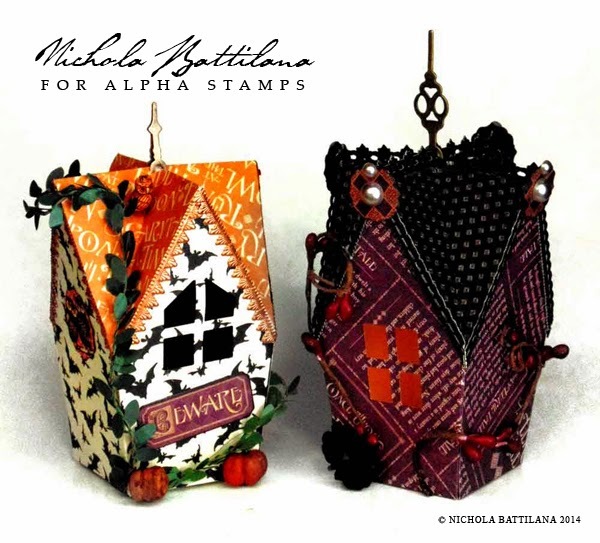 Will you be posting a pattern for this to purchase, Nichola? Duh, never mind, you just said the Tim Holtz die!!!!!! Good for mr. Pixie to get you the big shot! These are so cool! I love little houses and I can't wait to see what you come up with for Christmas!